I had scouted this property and bow hunted it for 4 or 5 days prior to the rifle season. I had seen some good rubs, (4 or 5 inch diameter trees rubbed) and had seen some early scraping activity as well. 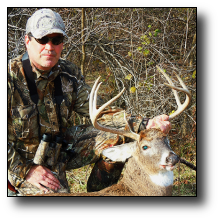 During the bow season, I had seen only small 4 point bucks and a few does, but I was pretty sure there was a bigger buck on the property. The deer were not moving much during daylight yet, and the temperatures were pretty warm. I wasn't able to hunt the property the opening weekend, as another club member had the property, and reported killing a buck there. Hence, I wasn't even sure if this bigger buck was still alive. I was hoping perhaps there was more than one! I hunted the property on the Monday after opening weekend, and only saw a spike buck and a doe. The temperatures continued to be pretty mild for the first couple of days into the season. When I saw that the weather was changing, with a cold front moving in Tuesday night, with highs only in the 40's on Wednesday, I elected to try again that morning, hoping the deer would be more active and perhaps more rut activity. The decision on where to set up was tricky. One of the main travel areas was a nearly dry creek bed with minimal timber and only about 25 yards wide with some timbered fingers running off of it. With the new North prevailing wind, which blew right down the creek bed into one of the main bedding areas that consisted of tall junipers. So the set up was difficult, because I needed to be able to see the creek bed and the timbered area, without being straight upwind of the bedding area. Some of the good rubs were along this creek bed. Before I arrived, I decided to set up on the east side of the travel corridor, about 100 yards from the creek, in an overgrown weed field with short hawthorn trees. I had about a 20 foot elevation leading down to the creek, so I could visualize any deer traveling along the creek. The east side of the creek was all overgrown weeds, and the west side was a slightly rising hill with timber and junipers, and a short grass field on the upper side. I had expected to see deer traveling on the low side of the creek, in the overgrown weeds. The temperature was about 28 degrees that morning. I did see one doe south of my position, and she may have winded me. I decided to stay put, because there just wasn't any other good spot to sit, without spreading my scent all over the creek and bedding area. At 830am, I spotted movement on the upper field on the opposite side of the creek. I had pre- ranged the creek at 100 yards. The middle of the field on the opposite side of the creek at 150 yards, and the furthermost top of the hill at 200 yards. I pulled up the scope and determined it was a shootable buck, at least an 8 point. The deer was traveling left to right in an opening I determined to be about 30 yards wide, across the 150 yard estimate on the opposite side of the creek. I made a doe call, and got him to stop. Went to shoot and I had not taken the safety off! When I clicked off the safety the buck was moving again, and about to disappear behind some timber. I centered the cross hairs behind his shoulder, and made the shot with the buck walking slowly. I heard him run into a timbered draw, and it sounded like he went down, but I wasn't sure. I went to the spot of the shot, and initially didn't see any blood. Walked down the area I thought he traveled and found some bright red blood spots, but initially no other blood. I looked into the draw, and didn't see anything. I then decided to go to the top of the draw and walk down it, knowing I should either find more of a blood trail or the deer. Walking down the draw, I saw the tell tale antler sticking up from the base of the draw in a small drainage ditch! Yahoo! I spent several minutes admiring the buck and taking it all in. He had only traveled about 50 yards. 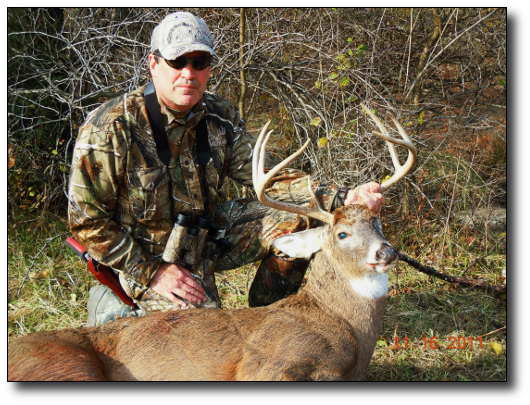 The deer was a nice typical 8 point, fairly wide, with one brow tine partially broken off. Estimate his live weight at about 180 lbs. He is on his way to the taxidermist!